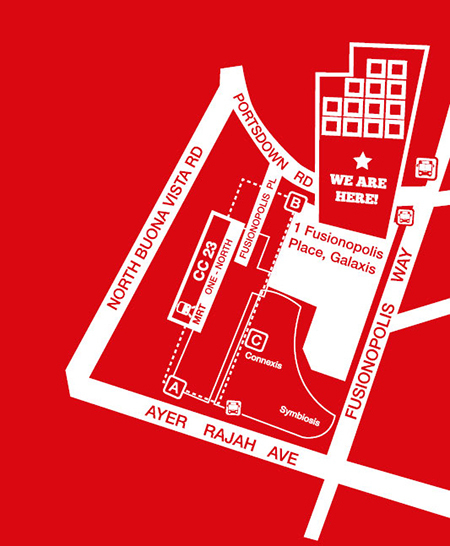 Below are directions to our offices at Fusionopolis Place, Galaxis via MRT, bus or car. The nearest MRT station is one-north (CC23), on the Circle Line (Orange Line). You can reach our office by car: - Via the Ayer Rajah Expressway (AYE), take exit 8 to North Buona Vista Road. Turn right to Portsdown Road, then turn right to Fusionopolis Place. *We would recommend you to check the best efficient driving directions from your departure location via the various online map services such as Google Maps.